The third time really is the charm. 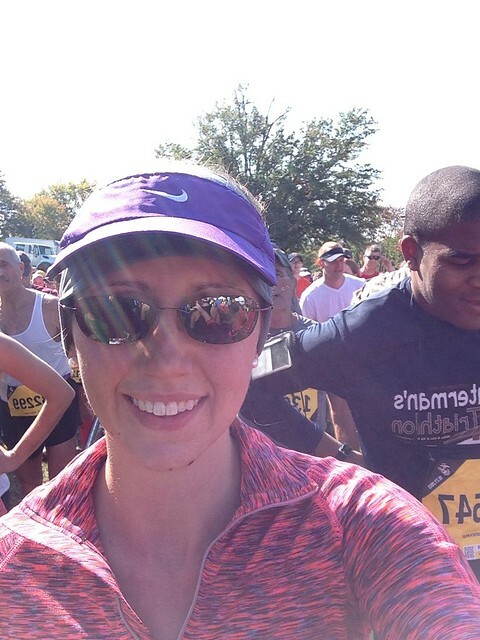 I can't even explain how much easier running your third marathon is compared to running your first, even your second! At least that was my experience with this marathon. I have already owned up to being kinda lazy about marathon training (just as I was with my triathlon training), so my expectation was just that I would finish my third marathon. 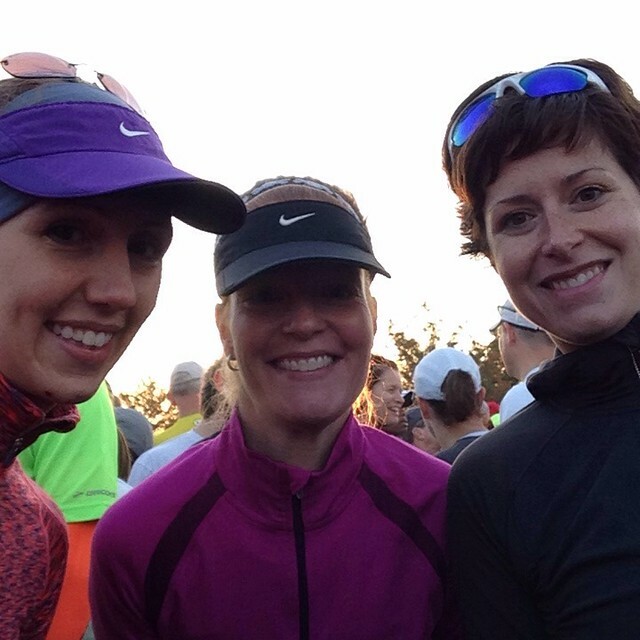 I did start to get encouraged by my long runs with Laura and Saskia, because we kept a pretty decent run pace, but then I was incredibly sore after the Army Ten Miler, so I really didn't know what to expect. Actually, I did know what to expect, I expected "the wall," but luckily, it was no where in sight for me! Last year I ran with Amanda and my only goal was to finish with a smile on my face. My first marathon was really difficult. I finished it in a respectable 4:31, but because I wasn't used to running on my own, I felt lonely and it was painful. 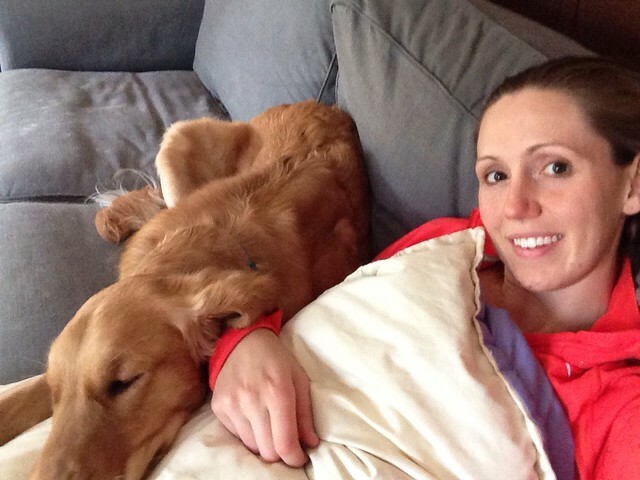 In contrast, the marathon with Amanda was one of my favorite runs ever! So this year, running on my own, somewhat untrained, I was expecting more of the first marathon, but I actually think I feel better than I did after last years run! The day started off with me considering sleeping in and skipping then run. But then I realized that would be ridiculous because I had waited over an hour to get my bib and shirt the day before. I at least had to show up! So I got dressed, packed 7 tri-berry GUs (my favorite flavor), took the puppy out, and realized that I was running a little late... I left in such a hurry that I actually left my 1/2 Udi's GF bagel in my toaster! I met my parents at their hotel so that my mom and I could go to the starting line. The MCM says to arrive at least 2 hours before race start and they are NOT KIDDING! My mom and I barely had time to wait in the portapotty line, check my bag, and make it to the start! 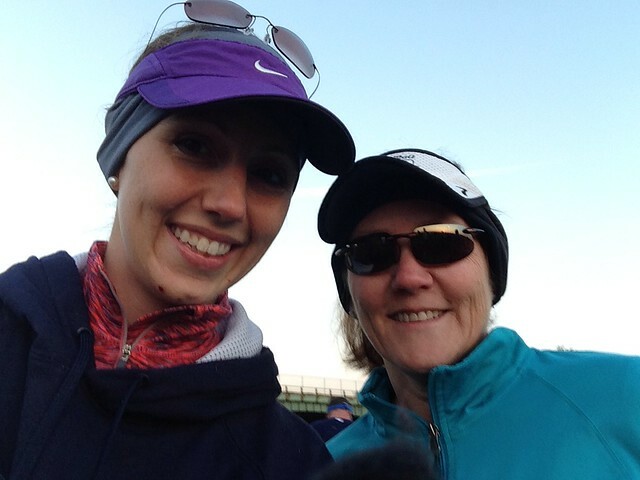 My mom was so cute when we were walking to the start corrals too. She told me to go on and find Saskia and Laura because "you know me, I'm a lone wolf." It was adorable. I did convince her to line up in front of the 5:30 group though! I think she ended up lining up around 5:15. I was super lucky and able to find Saskia and Laura easily! I met up with the girls and just hung out with them as we waited and then walked slowly to the start. Their plan was to run 10 minute miles, but we were lined up behind the 4:30 group, so our start was a little slower than planned. I stuck with them until just after mile 2 (both in the 11 minute range) when I realized that I was going to need to walk, so sticking with them on the runs just wasn't going to work for me. They were absolutely fine with it, so I took off an ran for a few minutes at my faster pace before I took my first walk break. It was really strange because once I got into my own rhythm, it actually felt easier than the army ten miler the weekend before. I remember passing mile 7 and looking at the other side of the course was mile 8, and thought "I'll be there in 9 minutes." I actually saw Laura and Saskia on the parkway while I was ahead of them, but they were in their zone. Shortly after that, around mile 9 where I had passed the 4:30 pace group a girl was telling her boyfriend that was spectating that if she caught the next balloons she'd be in a good place. I thought, "that would be kind of cool," knowing that the next balloons were the 4:15 pace group. Wouldn't you know it, sometime before the half I caught up with the 4:15 pace group! I played cat and mouse with them with my walk intervals for a while, then broke ahead for a bit. My splits at that time had me finishing at 4:05, which is awesome! By mile 18 I still hadn't seen Reid so I texted him and told myself that it was okay if I didn't see him during the race, because I would see him at the finish. By the 40k I had slowed down to a 4:09 pace and the 4:15 group (that had started ahead of me) passed me right after Crystal City. But that was okay because that's when Reid found me! I was literally running right by him as he was trying to get ready to take a photo of me! I kind of wish I had pushed the last little bit a little harder, but shoulda, woulda, coulda, I am so proud of my 22 minute PR marathon! I finished, feeling fantastic, at 4:09:45! I totally think I can break 4 hours soon! I spent the rest of my day amazed with my time, how good I felt, and dreaming about doing it again! That fulfills my goals 1)finish upright 2)happy 3)wanting to do it again! Penny was so proud of me that she cuddled the whole afternoon with me while I caught up on TV and researched marathon recovery!